Learn all the details about Trust Registration and setting up a non-profit organization in India in the form of a public charitable trust. I have registered a Trust myself and all this information is based on my own experience. I am sharing this researched information with you in order make my contribution towards encouragement of non-profit and voluntary work in India. Trusts are registered using a document called TRUST DEED. This document contains all the information about the Trust and is printed/written/typed on plain A4 size papers. Along with these papers you would need to attach a Rs. 100 Non-Judicial stamp paper (which you can get from a notary). All the Trustees and witnesses will have to give thumb impressions and signatures on these papers. All in all, you will need help of a notary to prepare the papers. Trustees cannot draw any remuneration from the trust fund. However, they may take reasonable compensation for the professional services they provide to the Trust. There no difference between a trust and a foundation. Profits earned by the Trust (e.g. interest gained from bank) cannot be distributed among the trustees. Trust Deed can be amended through a Supplementary Trust Deed. Most important part of the Trust Deed that you should pay special attention to is objectives of the trust. You should be as thorough as possible in writing down trust objectives so that you can function smoothly without any problems. At the time of registration, only the Settlor and two witnesses are required to be present in front of the Sub-registrar under whose jurisdiction the registered office address comes. Sub-registrar will check IDs of these people. After that the Trust Deed will go to the counter where data entry takes place. In the end, Settlor and two witnesses will be photographed. You will need to pay a fee of Rs. 1100 for this process. Of this amount, Rs. 100 will be the registration fee and Rs. 1000 will be the charges of keeping a copy of the Trust Deed with the sub-registrar. Donations to the public charitable trusts are also exempted from tax (i.e. the donor will not have to pay tax on the amount he donates to the trust). For this, you need to acquire 80G certificate from Income Tax Department. Usually lawyers and practicing CAs can help you in registration of trust –but I guess a lawyer is better person if you need help in formulating your Trust Deed. CAs don’t know the nitty-gritty of legal stuff. If you can write your own trust deed –and sure that you have done a good job –then all you need is the help of a notary who will take your Trust Deed and prepare it for presentation before the Registrar. After registration of the Trust, for acquiring 12A and 80G certificates, you may need to take services of a practicing CA. They charge hefty fee for these services. SEE ALSO: An important update on this article on registering a trust NGO If you need more information regarding this matter, you may comment on this article. UPDATE: There are now more than 400 comments on this page. So, I am closing comments on this page. You can ask your questions on my other NGO related articles. Thanks. Please feel free to ask if you have a specific question about the process of registering an NGO. Although I try to answer questions as much as possible, but I will suggest that you do research on your own as well. Also I request readers to reply to questions, if you know the answers. Let’s help each other by sharing knowledge! I’ve some corrections in my trust deed which was started in 2008, i.e. trust members names which has misspelt & how do i make a supplementary deed for this correction, besides, one of the member has died and his wife should be put in his position. Kindly advice me. All this is done through resolutions. Please contact a good lawyer. I have written a separate article on this issue. Can I use the same bank current account for Trust / NGO & for my personal purpose ? No! this is not appropriate. You should get a separate PAN card and a separate bank account for your NGO. I want to start an NGO. Can we give a name to the NGO which is already registered by someone else? It is advisable to try and use a unique name for your NGO. I just wanted you to know, that your blog was the best information provider regarding the registration of a trust. I researched for over a month and got the apt understanding from your blog. If you feel comfortable, please share your contact details on my Email ID, as i would like to consult you on other issues as well. Thanks a lot for making things easier for me. Akshit, it’s a great feeling to help someone. Thanks for taking time out to comment. I find it difficult to share my direct contact details because if I do so, I might be overwhelmed with calls and emails. TechWelkin is being used by hundreds of thousands of people. I try my best to answer as many queries as possible here in comments. All the best for your social work. Hi Lalit Ji …. First of all thanks for such a usefull blog. Your vast knowledge in this field is helping others. Great job done. Now coming to the point I’d like to tell you that we are running a registered trust for the last 15 yrs. We are doing our best for women’s esteem as we are training them to get self employed. Till now we are running this trust on our own funds. But now we are seeking donations as to expand our work. Please tell us how can we apply for government donations or funds. Waiting for your reply. We have just now registered a society in Haryana, I’ve some queries,Hope you will address it to it. 1) Can we register a NGO and function in all India through this society which is registered in Haryana. 2) what are the other organizations we can open through this society like Charitable Clinics, Old-age homes, Community library etc. 3) we are interested to keep both our society and NGO same name can we do that? or else we have to change the name for NGO. 4) Is there any tax exemption for any organization been opened under society. The society you register is itself an NGO. There is no need to register “an NGO” under a “Society”. Society = NGO. I think you’re not really clear about the NGO stuff. I would recommend that you consult a qualified lawyer or CA who has experience in the field of NGOs. Reference to the premise for the trust – if currently i have a property which i can register for trust later i decide to sell the property at that time could i change the address of the trust. Also selling the property hope would not be a issue. Please advice. Yes, Rahul, if you are the owner of the property, you can sell it and shift the registered office of the trust elsewhere. my question is that is it necessary to have a office for a trust. I mean what if we do not have a office?? if we are getting donations and we are using them for our trust purpose then is it really necessary to have a office?? Yes, if you want to properly register a trust, you have to have an office. You can not register a trust without having a physical address as your office. Sir! you have only explained about the process of registering a Trust but not a Society. So could you please provide me some advice for the registration of a Society that works for Disabled persons and the various processes or categories that is necessary for registration for such societies. I am sorry Ankit, the links in my article were broken. Now I have corrected the links. Please follow the links and read the relevant articles. My name is Chandra and wish to register a charitable trust in Thane, Maharashtra under an individual’s name , who is donating whole life earnings and savings for the trust. Her wish is to use it only for the benefits of blind people. Is there any rule for name of the trust? we wanted to register our trust as “Smita Ankadawala foundation for blind”. we were told that name is too long and it should not include the purpose in the name of trust. 1. is there a rule for the length of trust name? 2. does it have any restriction to include purpose in the trust name? Please reply ASAP, as our application has reach the concern person and we need to place our point in reply. Thank you for the blog. It has been very helpful for all of us. We have gone through the questionnaires. We have a few specific doubts. Please revet. Sorry, in case it is a repeated question. 1. Can a settler remain the head of the NGO and still appoint one of the trustees as Chairman with rights for day to day activities ? 2. Can a person become trustees of two different trust. ? Technically, all the trustees in a trust are at the same level of authority. Settlor is also just another trustee. See, a trust must not become a power game. A trust is based on trust and only like-minded people should be included as trustee. For more democratic ways, whose consequence is power struggle, Society is a better suited structure. I like trust because if good trustees come together and they work in unison —then trust is less of a hassle. A trust can work much more efficiently if like-minded people work solely for the welfare of society. One person can indeed become trustee in more than one trusts. The public charitable trust we are registering is about the use of scientific methods in improving the quality of life of common people in India. Under the aegis of this trust, we wish to establish a research centre which will carry out research projects and may (or may not) run courses of study. Would we need a separate mandate/resolution for establishing a research centre (or any institution) under the aegis of a trust? If your trust’s deed declares that you can establish and run such institutions, then you don’t need any other resolution as far as the trust is concerned. But you may need permissions from appropriate authorities depending upon the nature of your institution. You would need to research more about it. Can a NRI with OCI form a charitable trust in India. where can I get information that governs such trusts? Just want to say many thanks to Lalit Ji, very helpful information. We are doing some social activity such as education help arrange free, medical check up, cultural program, praise distribution to bright students, note books distribution. We collect the required fund from the people but we cant give them a proper receipt which can be used for income tax rebate. We do the activity for community like Patel. Can we establish any NGO trust. Yes, Jeet, you should register an NGO to formalize your social work. It will be beneficial to everyone. You’ll be able to show transparency in funds utilization and donors will benefit from tax exemption. KP Sharma ji, as far as I know, you will not get any tax rebate if you loan your savings to the trust. If you donate the money and the trust is qualified for 80G exemption, then you’ll get exemption. As for the implications for the trust, well there are no implications! You can start a trust by loaning money and later you can take your money back from the trust fund. My NGO is registered in Delhi with it’s Registered office in South Delhi. Now I wish to change the registered office of the NGO to my native house in Jabalpur. 1. Can it be done? If yes, then if a resolution for change of registered office to Jabalpur/or any other city in some other State is passed and same is intimated to Sub-registrar in Delhi, will it be sufficient? 2. If registered office is changed to an address in a State other than Delhi, will registrar in the new city need to be informed? I need to amend the objective of the Trust, which would be detail activities of one of the obectives mentioned in the Trust deed, will that have to be done on Stamp paper or on the letterhead of the Trust ? Well, you want to change the registered office as well as the objectives, why don’t you consider registering a fresh Trust in Jabalpur? As for transferring the registered office, you’ll need to inform sub-registrars of both the places as well as bank, Income Tax department and all the trustees and other stakeholders. Amending objectives is not an easy thing. You would need to prepare a complementary deed and get it registered with the sub-registrar. And of course you will need to inform all the concerned parties about the amended objectives. Hello Mr Lalit, recently I came across this NGO registered in India which happens to have the same name as another NGO is having in the country where I work. Both the NGO’s have totally different cause which they support. My question is: can you have NGO registered with same name existing elsewhere. Yes, well, if the existing foreign NGO does not work in multiple nations or if that NGO is not a well know name, then you can use the same name in India also. Registrar wouldn’t even know whether an NGO with the same name exists in another country. Hi Lalit Kumar I really like your article on public trusts. My question is that i want to formed trust with the motive of HOSPICE. for this any permission is needed or not? please guide me. Hi Sagar, for registering trust, I don’t think you need to do anything extra. But for actually opening a hospice, probably you’ll need additional permissions from various departments. I am not right person to guide you about what these permission could be or how to get them. Please speak with a lawyer who has experience in relevant cases. All the best for your noble work! Yes you can register a trust for this purpose. How to pass a resolution in a trust? Write your resolution of Trust’s letterhead and get it signed by all the trustees. I and my friends wish to start NGO but all lives at different places, I wanted to ask that if for registration owning some property is must. Like if I show that I would run NGO office from my residential house (own in Pune) will that b possible? And valid? I live in Pune I also have one house at my native place Amravati. So is it possible to register there n operate from here. Yes, Sheetal, it is possible. You can register the trust at your Pune address and for operational purpose you can use Amravati house. However, you must ensure that you file audited accounts to the Income Tax office under who has jurisdiction over your Pune property. 1. Is there any waiting period (1 year or so) before registering it? 2. Is the registration done with Charity Commissioner or Registrar of Companies? 3. Registration of Trust, is it different than Registration of Foundation? Hi Vikram, I can not comment about private trusts. Please take advice from your lawyer. I wanted to start NGO which will deal with different types of rural issues like eduction,medical,employment. Question : Once we register NGO, can we address any type of issues like eduction,medical,employment or it needs to function in specific area only as they are register for specific purpose ? You need to be specific about your objectives and purpose of NGO. I have a question for you. I live here in Pune, Maharashtra. I want to set up an NGO with registered address as of my home town (Nashik, Maharashtra). Is it possible to register the NGO in one district and work under it in some other district of the same state? Your article is very informative and constructive for the persons like me those who are looking to setup a NGO. Actually I have a query, i want to start a NGO which will provide coaching of Football for girls in Madhya Pradesh. Are there any special terms and conditions for NGO related to sports? Please give your important suggestions. Hello Ajay, I am not aware of any such special rules for sports related NGOs. No special Norms for sports ngo. But as soon as your motive involves girls you can get govt funding and support towards the initiative. The govt also gives additional tax benefits for the same. Thanks so much for all these informations. Mr Lalit, my 15 year old son has a neurological birth defect called spina bifida. While we are blessed by God and are able to take care of all his needs, we have come across more such specially challenged kids whose families are unable to bear their medical expenses. So I was thinking of setting up an ngo soon, but as my son is only 15, I cannot make him a Trustee which would have ben good for him. So can I make my mother in law who is a retired school teacher one of the trustees and make my son the other? or will he have to wait until he is 18? Also, we both his parents are working, can we become members of the trust? Please guide? Thankyou. Renu ji, namaskaar! the best way would be to register a trust with you and your spouse as founding trustees. You need only two people to start a trust. You can add your mother in law as well as trustee. When you son turns 18, you can make him also a trustee. Heyy.. Is it possible to add some points in the objective section later?? I mean after a year? You can do that by passing a resolution. But you would need to notify the bank, registrar and the Income Tax department. Also, the changes should be minor. If you want to bring in sea changes, better register a new trust. Thanks a lot Lalit for providing such a nice info..
We are 4 school friends want to start a school to provide quality education to the bright and poor students (5-10th or +12th in future) without any charge. We all are from (Kisanganj District Bihar). Still there is no school exists in my village our nearby area which can provide quality education and guide and motivate them for higher education. We all are doing job and living in different places. We all have good network of friends who can donate for such school. 1. Is such school will come under NGO or some separate registration is needed. 2. Can we hire and pay teachers from the donated funds. 3. How to get the affiliation for the school/Trust for board exam. 4. How is the criterion to open the account on school/Foundation’s name? Maswood, I can not answer all these queries but yes you can run a school under a trust and pay salaries of teachers from the trust’s fund. To Start a School You need to register as a Trust or a Society. Then you need to set up the infrastructure and apply for No objection certificate from the education dept. After that you need to apply for your affiliation of Board, please note that each board has its own requirement so check that up separately. Yes, you can. In case of Public Charitable Trusts, there is not restrictions on blood relatives to become trustees. sir i just want to help girls …….in various fields ….through whichever source i can ……be it money or counseling ….anything ……i am willing to work hard …..indeed very hard and i will gather a huge support from m friends too ….i am willing to do anything to help girls …..i promise to be enthusiastic always …..sir i aspire to become an IAS officer in future …..but i am only 17 at present and i just cant wait so long to help people ….is it necessary to open a trust or can i just do it by a group ? I would suggest that you begin your work as a small group of friends. If your group succeeds in doing some good work, then you should register a Trust so that you can gather more resources for your charitable work. All the best. Thanks for the article and open Q&A! My age is 17+ by this dec i am 18 year old. whether this age allows me to open a charitable trust by combination of my friends of this age level? plz answer sir!!! To be able to become a Settlor or Trustee in a public trust, one needs to be over 18 years of age. Sir, I have to change some of the trustees and also want to change the address of the trust. What is the procedure for this? please let me know. You can do all this by passing a resolution. Removing trustees depends on how you have defined the process in your trust deed. Should I go to the same registrar office (where I registered my trust) for the same and submit any written document? Please reply with the procedure to follow for the same. In fact, I didn’t mentioned anything about the removal of trustees in my trust deed. In Trust Deed, if you haven’t mentioned how to remove a trustee, that shows that your trust deed has loophole(s). Removal of trustees is one of the most basic requirements of any trust and the rules about how a trustee can be removed must be mentioned in the deed. Better register a new trust with a fresh and solid trust deed. Thanks for the beautiful article. I have registered a Trust in Tamilnadu with my home as registered office. Now I am planning to sell my home and move to Karnataka and settle down permanently. Can I change registered address to Karnataka or I can continue current address? Please is there any problem related to jurisdiction between states? Hi Kumar, yes, you can change the registered office. Or alternatively, you can just make some arrangements to get the postal mail coming to your TN address forwarded to your Karnataka address. Can NRI be a trustee? Yes, an NRI can be appointed as a trustee. But if possible, it should be avoided as there are some technical clauses in the Section 10 of the Indian Trusts Act which may create a problem. All in all… you can appoint an NRI a trustee, if it is unavoidable. You would need to work for three years and file your audited accounts at the Income Tax office. After that you’ll be eligible for FCRA. Hi Lalith, hats off for valuable information. Good job. I want open trust for awareness of donet human organs. so is their any property required . (2) My Family member can be a trusty. (3) is their own office required for it. Family members can become Trustees. Hello sir,,,, I really appreciate your valuable information. And at the same time I want to ask you something…. currently I'm trying to register my organisation as trust, but from the beginning i.e in 2004 the name which I have kept was xyzEnterprises. Do you have any idea if the trust name ending with "Enterprises" can register as trust? Also I would like to ask you one favor..I'm from India, Manipur state…can you please suggest me where can I find the Registrar office? Thank you so much. Hope that you will definitely provide positive answer. "Enterprises" is not a suitable word for a social work organization. I would suggest that you select another name. I am sorry, I do not know the location of the registrar's office in Manipur. When you register a trust or society, your get a registration number. your blog motivates me very much., thanks so much for such useful info about the registration procedures…. I'm from Arunachal Pradesh-India and want to open an NGO. 1. Is their any specific education qualification required for the founder and other members ? 2. I want to promote education for Adults, computer classes for dropout students and to organize cleanliness drive in our state…. There is no minimum level of formal education required to be a trustee. iam overwhelmed with your intention of blog and especially the patience u show in answering every category of a question. i read 60%of the queries but i cud find no interconnected solution to my doubts.so iam writing to u.
as per the knowledge gained from your site i need to setup a public charitable trust..my aim is to distribute some articles or things or any subsidy related stuff to people especially rural side.exmple: a cfl bulb which we get for 100 rupees approx,wanted to be distributed for fifty.given u the goal.please give me the overview and guidelines of the procedure as soon as possible.thanking u.
Raghunandan ji, guidelines are already there in my articles. If you have any specific question, I can try to answer that. But please be very specific. I'm based is Australia, I what to know how to start a charitable trust For orphans and old age people. Any suggestions? ? Sir, your information is very useful. Thank you so much for this great help for all. 1. Can a person working somewhere be a trustee or settler? 2. Some one told me that if we register a trust in MP then its area of operation would be in that state only. For another state we need to obtainn a seperate registration. is it true? if yes, can we get a nartional level registration done? 3. How many people can be authorised signatories to handle account of the trust with the Bank? 3. Usually one or two people act as authorized signatory. Sir, I have 1 question regarding trust, I need your valuable advice. 1) Is there any possibility that a "society can be converted into a trust" (transferring all the assets of the society to trust) specially in Karnataka. 2) If yes, then what are the procedure to do so. You can not convert a society into a trust (or vice versa). You can create a new trust with same or similar objectives as the society and then donate all the assets of the society to the new trust. We have a NGO with a govt approved certificate. We want to open a bank account. But, Our NGO location is like rural area and we want to open the bank account city area which is not located to same district or same area as per NGO registered address. So, I would like to know whether it is possible to open in City location. You can open a bank account for NGO anywhere. Please let me know weather it is mandatory to go for 12A AND 80g registrations with income tax department if our income is less than ten lakhs. The 12a and 80g certificates have nothing to do with your trust's income. If you have 80g, you will not need to pay tax on donations collected. But even if you have 80g and your trust is generating income of more than Rs. 10 lakhs, you'll have to pay tax on that. Thank you for the extreme clarity that your articles provide on registering a trust and society as well as the differences. This has helped me to take the decision to register my NGO (planned) as a trust. My idea is to help people access the government services that they are eligible for. 2) If I have registered the trust office in one place (e.g. Delhi) If I subsequently move, can i) the address be changed? ii)would future paperwork related to the trust -e.g. supplementary deed if necessary etc have to be undertaken in the offices where the trust is originally registered or can this be done at offices in the new town/city one is working from? I realise you may not know the answers to this! but the informaion you provided has already been of incredible use. Trusts have nothing to do with property. What you might be referring to is a "private trust" which people usually create to manage a significant property. But these trusts have no charitable goal. If you want to do some social work, what you register is a public charitable trust. Such trusts do not need to have any properties. You can change the registered address later on, but you will have to notify this to the registrar and the income tax department. An alternative is that you open an office of your trust elsewhere but let the registered address remain same. All the operations of the trust would be done at the new office. However, because the registrar and IT department would know only the registered address, they will send all the correspondence to that address. You must make sure that you collect mail from the registered address. Dear Major Saab, your questions are very case specific. I have just been guiding people about Trust registration related queries. I am not a legal expert. You should consult your lawyer about these issues. But honestly, if your trust is a charitable trust, I find it a bit difficult to understand the word "investment". People either give donations or loans to charitable trusts. Donations are not to be taken back. Loans will be paid back by the trust. But I am a bit lost as to how come trustees make an "investment" into a charitable trust and then demand their share back! But as I said, I am not an expert. Such things may happen in case of private trusts. And all I know is about public charitable trusts. No idea about how private trusts work. Dear Lalita. Sorry I think I used the incorrect word. It should have been contribution and not investment. Now like when we are taking over a trust old trustees are demanding their contribution back . Basically we are only two new trustees who are taking it over. I am contributing 90percent and second trustee 10percent. We are planning to show our contribution as loan to the trust . I am hoping this trust will exist for ever but due to any reason the second trustee who is practically running the school of trust withdraws in that case I may have to hand over trust to somebody else. And .if the new trustees want me out how my contribution given as loan comes back. That is my question. I am not expecting any return. Thanks. Major bajaj. Well, as I said, loan can be taken back. What you give to the trust as loan should keep on forwarding year after year as a liability on trust. Whenever you want your loan back, you can make a claim and trust will pay you. As simple as that. If accounts on the trust show that trust has taken "Rs. XYZ from Major Mohan Bajaj as loan" then you have a valid claim to take it back and the trust will have to pay you. It is really helpful info. thank you so much for sharing. In the year 1997, I have started one educational trust. I am the founder of the trust. Along with me there are other 13 member registered initially. Goal the trust is starting the educational institutions . and few educational institution started and it functioning under the trust. In the mean time majority of member joined together and expelled the founder by using fake resignation letter. Now the founder challenged in the DPJ court. Now the DPJ court is rejected his petition after 3 yrs reason is , to file a case trust auditor general permission is needed. Is it correct sir, please advise me for further action. I am sorry Sir, but I can not answer your query with confidence. It's a legal matter, please consult your lawyer. 1. Can members of a trust be from different cities? 2. Can a NRI be the member? 3. Is there any hinderence to be trustee if you work somewhere..? I am trustee of a trust along with 30 other trustees. We all belong to different cities of India. For the last few months we are being imposed to either create, mend the by-laws and to enter one or two new trustees in the trust. These people are not having their names in the good books of public at large of their own cities. Will you please suggest me if and how can we stop such bad elements to enter our trust? Anand ji, I really can not answer your question because the answer depends on what's written in the Trust Deed. Usually Trust Deed mentions that the decisions will be taken with the help of majority. So, if most of the trustees think as you think then no law could be mend and no new trustees could be appointed. Please get hold of a copy of the Trust Deed and study it carefully to find avenues for your concerns. thanks Mr. Lalit Kumar for providing such a good information. 1. a setter can remove any trustee and appoint other person as trustee in his place? 2. majority of trustees can remove any trustee and appoint other person as trustee in his place? 3. can we alter/ modify trust deed? how? All answers depend on what's written in the Trust Deed. The Deed is the document that governs what can be done and what can not be done. Any trustee should join the trust only after carefully studying the Trust Deed. If you think you like the objectives and rules of Trust, only then accept the Trusteeship because you'll not be able to do much beyond what is said in the Deed. 1. I am an engineer we just want to start a trust for helping the only women by providing finance support in less interest to start their own business. now my question is that whether the interest gain by that financial support is a taxable income to the trust? 2. Mean while i would like to start a company in the name of trust where i can give the work only for women. So the income caused by this trust will have any tax exemption? 3. Whether the trust to be registered as a public or private? 4. Note:All income will be utilized for future development. 5. Whether we have to mention the future development in trust in "Trust Deed". 4. What will be the procedure to change the name of the settler after his death? Answer to 1 and 2: Yes, it would be considered as income of the Trust. Business income up to 10 lakhs is exempted from income tax. Ans. 3: It depends on you. Ans 5: Yes, you should. You will not be allowed to do anything that you don't mention in the Trust Deed. Ans 6: That's a funny question, I have to say! Settlor ALWAYS remains Settlor. You can not say that Eiffel Tower was made by some XYZ because now Gustave Eiffel is dead! If the Settlor is also holding some post (like Chairman) in the Trust, then you can name someone else as Chairman after the person is no more. But the title of Settlor will always be that of the person who CREATED the Trust. We are NRI's and do not have Indian passports of any other identification for India. We are looking to set up a charitable hospital in Tribal area to provide them with adequate health care. I was hoping to register a public trust as we would be running the hospital on donations mainly from the foreign funds. I wonder whether it is possible for us to register a trust which seem difficult being British citizens? or what are the other options? If FCAR requries three years track records then is there any other way we can received foreign funds, as the hospital will be constructed and run on funds from overseas? Can we have a trust in UK (where we live) and work in India? This way funds will come to us in UK and we would deliver them in India in our own trust. Is it possible to have sister trust in India with same name etc, having main trust in UK? I would be grateful if you are able to provide some guidance what ever you can. Well, I don't have many answers. But as you no longer possess Indian passports, you're technically not an Indian citizen. So, if you want to register a trust in India, you'll have to use other people who reside here. Lack of Foreign Contribution Regulation Act (FCRA) will pose hurdles in your way to pump in money into an Indian trust. The idea of registering a trust in UK and then work here in India may work but you will have to seek permissions from relevant authorities (especially because you want to work in the are of healthcare). Channeling foreign funds to kick start a new trust could be tricky for you. I know my answer is not of any help. But please let us know your experience as you proceed in solving these problems. Other readers will benefit from your experience. Thank you! I would like to know if a Trustee can resign from the trust ? Is their any limit of turnover in trust (i.e. Rs.10 Lacs) to get Income tax certificate for (80G or 12A) ? Can we change the objective of trust after some years ? Yes, a trust can resign. Yes, turnover limit is Rs. 10 lakh. As far as I know, you can not change main objectives of the Trust. If there are radical changes, better create a new trust. can we designated one as Chairman and another as Secretary? for this i will have to report to sub-registrar or any gov.official. Is It compulsory to have a treasurer in trust? Yes, you can make one person the Chairman and the other a Secretary of the Trust. Pass a resolution to this effect. It is not necessary for a Trust to have a Treasurer. Will i have to inform the sub- registrar or to income tax department of this effect? Settlor can operate the bank account of the trust. 1. I want to change my registered office, so please tell me the processor? 2. Can i establish a head office out side of registered state? like Trust registered in Odisha and i want to set up head office in Delhi. for this what i have to do? 3. Can i open more than one bank account? 4. Can i open bank account in other state? You can change the registered office by the means of a resolution. You may be able to open more than one bank accounts but you can not have more than one PAN numbers. In case of Trusts, I don't think you should have any problem in setting up office outside the state where you originally registered the trust. I would suggest that you speak with your lawyer also for more details. I have a registered education society called Rivers Education Foundation. I have started a preschool and a teacher training centre under this. I was told that as a registered society we can offer 3 month certified montessori training course. And we have started the course 1 and half month back. Will you please confirm if we can provide a certificate at the end of the course? I am sorry, Reshma. I do not have an answer for you. I hope other readers will shed some light on this issue. Really very good article to under stand the Trust registeration. My Grand father was build one temple on 1980s and before that temple some empty land is there. His dream is to construct the kalan mandaban in along with temple. Now the temple was in not good condition and i am planning to re innvoate that template as well as use that empty land to construct the Kalana mandabam. For that i am planning to register the trust and collect the donation and build the temple and kalan mandaban on behalf of trust which help for the poor people. Suggest how i can go with kind of situatiation..
As your cause is to help poor people and also because you want to accept donations from public, you should create a public charitable trust. Please speak with your lawyer for further details. RECENTLY I HAVE REGISTERED A PUBLIC CHARITABLE TRUST…WRITTEN IN DEED THAT MINIMUM 2 TRUSTEES AND MAXIMUM 5 TRUSTEES.. BUT AT THE TIME OF REGISTRATION WE HAVE WRITTEN THE NAME OF TWO TRUSTEES IN DEED (SETTLORE AND 1 TRUSTEE)…. You don’t need to inform the Registrar but you may need to inform your bank and Income Tax office. Please go to your bank branch and ask them if they need the copy of resolution which will make new appointments of Trustees. My articles are about public charitable trusts —I can not really comment on the private trusts. At initial level we want to provide First primary unit ie. Toilet to protect Female’s Respect and Safety in rural Ares. Please provide help full information and procedure to initialize as soon as possible. Also suggest how can we get DONORS for the above. What is the difference between public charitable trust and public charitable foundation?? Is it that a trust is for a specific community and in foundation welfare of different community in form of projects is there?? “Foundation” is just a word which people often use as part of the name of the societies and trusts. I have some queries- I want to registered one trust and that will be a private trust. 1. In that private trust, the trustee will be a minor, then how all things go in the registration, what precautionary steps to be taken? 2. Kindly tell what is most benefited to client , Society or Trust. I don’t have much knowledge about private trusts. What I have written in my articles pertains to the public charitable trusts. As for which is “most beneficial”, well, it doesn’t matter. Benefit for the society comes from the hard work and dedication of the social workers. In 2009 we have registred a charitable trust under bombay public trust Act 1950 and not applied for 12a and 80G. now we shifted to kerala, and we want start activities with this trust. 1. we want to amend the trsut deed. 2.we want to apply for 12A and 80G. 3.we are ready to submit the audit reports and accounts via a CA eventhough no activities/transactions are made through this trust. what are the possibilities to get all this answered? we will be in kerala in future , we need to be under kerala jurisdiction and we need to amend the trust deed what are the remedies? Better register a new trust. But under which authority should Trust be registered (which Sub-registrar)? As I wrote in the article, Trust will be registered by the sub-registrar under whose jurisdiction the registered address of Trust will come. We 2-3 persons want to create a trust for social activities like Spiritual discourses, education and medical aid for poor etc. Initially when the Trust will be created there would be no property and there would be no owner. The trust will utilize the collections made by the Trustees or any charity from outside. anyone person among us could hold the funds collected. Then in Trust Deed, what should be mentioned that who will hold the funds collected (even if it is a very small amount), what should be clause in Trust deed? Who will be the Settlor in this case? Under which Act should we create Trust ? Indian Trust Act 1882 or Charitable and Religious Trusts Act 1920? Is “General public” be the beneficiary in this case? Shall these 2-3 persons be trustees (who will be the owner)? Who shall be the author/authors of the Trust Deed? Shall the Trust deed be executed on non-judicial paper? If yes, then what should be the value of paper? Is it necessary to get the Trust registered (if it is a public trust)? With which Authority? Is registration with Income Tax dept. (for Tax exemption) necessary? What is the registration procedure with Income Tax dept? Time duration for registration? Is the audit of the Trust mandatory (even if it is small trust with few funds)? Or if Income Tax is NIL on computation? Does the TRUST have to file the income Tax return every year? Should the method of winding up the trust be mentioned in the Trust Deed? 2) You can not (and should not) hold funds “in hand”. Open a bank account and deposit all the donations in there. An authorized signatory will be able to draw money from account by signing cheques. 3) If you want 12A and 80G, you will have to file for IT return of the Trust, EVERY year. Had meetings, nor had maintained any records, even bank account is not opened. Now my question is can we consider that our society as live? Now we want to do and follow all documentation as per law what to be done, do this two members are sufficient make resolution and approve, what to be done to amend our bylaws, please guide us that we may stream line everything in order. Pramod ji, technically the society is still alive. But you may consider registering a fresh organization with fresh MoA and Rules and Regulations. 1. Is it mandatory to get 12A certificate before applying for 80 G? 2. 12A certificate allows you not to pay any tax on donations you collect. 3. You can make portfolio of any office bearers. Ayush, yes can register an NGO on a rented property also. But you will need a No Objection Certificate (NOC) from the owner of the property. I wanted to name the public trust “……….. Foundations”. The sub registrar is insisting that it should be “……. Trust” instead of Foundations. Is that correct? There is no restriction of using “Foundation” word as part of the name of a public charitable trust. I am Ankit shukla m opening NGO in next 2 to 3 months for Awareness and public work for that those who are not elligible for earn income. Thanks for sharing such valuable information. I have a query regarding a charitable school that runs under a private trust. The property on which the school runs is personal and the owner of this property (also a member of the trust) receives a salary for providing services to the school and running it. I want to know that in this case who would be the owner of the income that is generated by this school. Would it belong to the school, or the owner? Also, could the running school be inherited by a family member of the owner? Areena Abbas, the school and its income belongs to the trust (public or private whatever it is). Everything will be decided on the basis of what is written in the Trust Deed. In case of private trusts, if the Trust Deed allows it, the owner of land can take all or some profit from the school’s income. Thanks for your response. Would appreciate if you could also confirm if the school can be inherited by a family member of the owner. As it is a matter of private trust and I have dealt only with public charitable trusts, I can not answer for sure. But everything depends on the Trust Deed. If that document allows inheritance, it can be inherited. Thanks and Best wishes for wonderful work being done by you. You can show a rented property as registered office but in that case you’ll have to get a no objection certificate from your landlord. We are having a registered NGO registered under WB societies registration act.1961 and working since last 7 yrs. in West Bengal. Running one Primary school also. We want to take some loan for the development of the school but our bye-laws don’t permit it. Whether we can register it under Trust Act with the same name. Whether the Secy. of the NGO will be the settlor as well as he will be one of the trusttee also. Shall be grateful if you pl.guide us. You would need at least two people to register a Trust. Settlor is also a Trustee and you would need another person who can be a trustee. It is possible have a Trust or Society get registered with a name having word ‘ National’. Is it possible have a Trust or Society get registered with a name having word ‘ National’? Registar objects to the word “National” as part of an NGO’s name. Hello Ardhendu, Registrar will object to the use of “National” in NGO’s name. I have had the interest to start an old age home in Kolkata. I am an NRI and have few well wishers ready to support my cause Wonder if you could guide with steps to follow from forming a trust, registering it, obtaining legal status, funding , ability to receive funds from India an abroad, acquiring land for construction and then recruiting staff to run the day to day operations how do we go about govt afficiliation, tax exemption etc. thank you in advance. Regards. Well Jose, thank you for your comment! I have written these articles to answer just the questions you’ve asked. I expect readers to read all the articles. Most of the questions have been answered in these articles. It is suggested that all the readers ask questions ONLY after reading all the articles. Mr Lalit, Thanks so much for share the valuable knowledge with publicI just want to know about one thing. If the trust registered by government. Then how much time the validity of trust. Hi Rajneesh, registration of trust DOES mean that the trust is valid. Thanks Chakrag! …. hahaha… I love helping people and do voluntary work. I work for more than 12 hours everyday (7 days a week) and 80% of what I do is for social cause! its my good luck to find you.I really need your help for registration of society in Assam.here I want to help the poor students providing them meet their requirement in education through this process.I had consult a lawyer also but it charge very high fees which is beyond my capacity.but I can’t see all those student suffer and to quit in the middle of their academic session.please help. Dear Ebenezar Vaiphei, I have written all these articles just to help people like you. These articles on the topic of Trusts, Societies and NGO working contain all the basic information that you need. Please do let me know if you have a specific question. I will try to help. i wish to start social trust for rural women empowerment purpose. i am living in same district urban area.can i register my office address in urban area? Yes, you can register a trust anywhere. It’s just that your registered office address must fall under the jurisdiction of the sub-registrar you want to approach. You can mention the tenure of Founder Trustees in your trust deed. They can even be lifelong office bearers. This is satish, we friends are going to make old age home for our self. we all are in government job .My question is whether we need to make charitable trust for making old age home. if yes then then what are the benefits we will get from charitable trust. If you’re making an old age home for yourself, there is no charitable aspect in it. It’s your personal issue. But if you want to make an old age home for other elderly people, then you can do it through a charitable trust or a society. Rest all I have mentioned in my articles. Hi, Where can I find information about already registered trusts. Do they need to disclose accounts? myself is a doctor and want to start a health trust. i have come to know that a trust should be old enough to gain any benefits/ donations or for certain rights. i m not sure u still will still reply on the post, but i want to know if we can purchase a preexisting trust. or if this is possible from where we can get information that XYZ trust is available for same. i searched online but couldn’t find information about this. Hi Silky, a trust needs to be three years old (with significant activity during these years) in order to apply for FCRA. FCRA certificate allows you to receive foreign funds. Apart from this, there are no other things that a newly registered trust can not do. Yes, some donor may prefer to see the work done and therefore the trust must be functional for sometime. You may “purchase” a trust. I have heard people do that. But personally I am against this idea of selling or buying trusts. The whole idea of social work is to WORK. If one is serious about doing something for the society, they can do it even with little resources to begin with. One does not need an old trust which can immediately get big funding. As far as, I know, there is no such online marketplace for trusts. If you wish to purchase a trust, you’ll have to ask around. Can a trust change its name after settlor dies? I don’t think so. But please consult a good lawyer for more details. Very informative article. I would like to know if a Charitable trust be formed with in an existing charitable trust. Kind of like wholly owned subsidiary concept in case of registered companies. This would help the charitable trust pursuing various activities such as education, health, community development, etc, to establish subsidiary charitable trusts, where each subsidiary pursue one thrust area. Thus developing their own identity under an umbrella or parent organisation/Charitable trust. In some cases people follow this model. But I don’t think there is any connection among all the charitable trusts. Each trust is a separate entity but you can name them in a way so as to make them sound as sister concerns of a parent trust. We, a group of Indian friends in Dubai, want to start a public charitable trust for granting scholarships to needy students in India. Do we all have to go india for registration of trust deed or this deed can be attested by Indian embassy dubai and later sent to a lawyer in India to get it registered with registrar and income tax offices. I am sorry Jagdish, I do not have confirmed information on this. Please let us know how you go about it so that other readers could benefit from your experience. Thanks for asking the question. Dear Sir, An important question I have a trust registered in Madhya Pradesh under MP Piblic Trust Act and its now more than three years now for its registration. Due to some issues I wasn’t able to work much on thr trust though it worked to some extent and haven’t taken any 80G, 12A and FCRA on it and also not filled the returns though audit is done for all years. Now what should I do and if I want to merge or upgrade it to a section 8 (sec. 25 company) how it will be possible. Please suggest me the way to make it happen as I am getting good funds from some my foreign settled NRI so i can apply for FCRA ..now its more than 3 years now. As far as I know, you can not convert a charitable trust into a section 25 company. You should register a fresh Sec 25 company. Honestly, it was not acceptable on your part not to get the trust audited even if the trust did not do anything. Now if you’ll try to convert it into a Sec 25 company, it would smell fishy to your (small) donors as well as IT department. 1. If both setller and other person in the turst deed passes away then what will happen to money which is in the trust. Will govt takes over or what will be further course of actions? 2. Can settler write a WILL that all his property would be to his Trust once after his death and no one else has rights to aquire his property. 3. Shall a settler gets Tax exemption for the amounts he donates to the trust from his income. Dear Ramkumar ji, You should have mentioned in your trust deed as to what will happen if all the sitting trustees pass away without bringing in any new people. If you have not mentioned it in trust deed, you can write a supplementary deed and pass it as a resolution. You must give a copy of this supplementary trust deed to your registrar, bank and Income Tax office. Yes, settler should be able to make a will to donate all his property to the Trust. Yes, settler will also get 80G benefit on the donations made to his Trust. This is sanjay here once again to thank u for my query and your valuable suggestions. we friends are going to start a public charitable trust which will work mainly for orphans and old age people of the society. our main motive is to serve the needy people of the society. I hope your comments and suggestions will be very helpful for us in future also. glad to interact with you online. thanks once again. Sir I am Moloy Malakar, and also involve ATrust( Mahatma heniman and samijee Trust) We are face some problem , how we 12A FORM APPLYING please suggest me. I would suggest you to go to the Income Tax office which has jurisdiction over your registered address. I have written about how to get 80G and 12A exemption. Read this article and more information you’ll get from the IT office. All the best. I’ m having 3 Problems while creating trust? 1.CAN I NAME MY TRUST WITH A WORD “KHWAAB”? 2.ON WHOSE STAMP PAPER TO BE TAKEN? 3.IS THERE ANY IF I NOTARISE THE STAMP PAPER? Hi Ayush, You can use the word “Khwaab” in your Trust’s name. You can buy stamp paper from any notary. It is not possible to convert a public trust into a private trust. my frnds and me are running out a small unit “just for a smile ,please smile”. for the upliftment of orphan society. sir i have few queries to be cleared out. 1. sir how can WE register our unit as an official trust.? 2.where is the registration procedure carried out? 3.can we shorten the unit’s name to “SMILE”? Dear Raj Sanchu, this article contains answers to your questions. Please read it. I want to give free tuition for Poor children & state govt. school’s students nearby my home with some my friends. We all are decided that we organize a NGO but i we don’t know how we can register it and where. please give us full information about this type of NGO. What we need to do. Dear Gaurav, whatever you need to know, or at least whatever I know, has been explained in my articles. Please read and follow. You’ll reach your goal. All the best! our trust is registered under bombay public trust and we have a school running under it in Odisha. When we applied for school accreditation, they are asking for a documental proof to show that Trust is national level. They are not accepting the statement that the trust by default is national. This is interesting. All I can say is that you should speak with the Charity Commissioner of your region (as mentioned in the THE BOMBAY PUBLIC TRUSTS ACT, 1950. Ask him/her this question. And please also let me know what solution you got for this problem. Your answer may help future readers on this article. Thanks! I have a Trust and a Scheduled Cast Person wants to sale his Land to my Trust. And also I want to purchase the same. Please suggest me the process of purchase the Land in details. Please consult a lawyer in this regard. It has nothing to do with the Trust. Trusts can buy properties (if it is mentioned in the Trust Deed). But you need to look at other aspects like whether the land SHOULD BE purchased. If it is a charity trust then you must be using public money to buy the land. Then of course you would want to be extra careful in doing whatever you’re doing with that money. Our organisation is working for the youth welfare in different countries and we are looking for land or independent building on lease in delhi either from the govt/ ptivate/ NGO. Can you please guide or suggest us if there is any possibility to get it as soon as possible. I am sorry, I can not help in this regard. Sir can a public charitable trust award dca certificate. Is there any other registration is required for the same. Prashant, what is a DCA certificate? Sir i already register a private charitable trust but one of my trustee create problem and that can harm for my beneficiaries. Can i force fully cutout his name from deed i am the author of hat trust. Dear Supriya ji, I am not very well-versed with private trusts, but technically you can not make changes in the Trust Deed after it is made. You can, however, pass a separate resolution (signed by all the trustees) and kick out the rouge trustee. 1. Can i do social welfare, charitable,educational (edu-institutions), health medical activities, all under one trust? 2. Can I use my house address for trust registered office. Hello Binu, the answer to all your questions is Yes! Well, in case of a Trust, all you need is a Trust Deed. 1 ) CAN A TRUSTEE do job in her institution with all the required qualifications like any other Teacher working at the same level. 2) Can SHE draw a Salary in her institution at par with average market norms for salary ?? 3) Which Trust Act is applicable for Uttar Pradesh..whether it is Bombay Public Trusts Act or any other Act ? We have already registered trust in Thane (Mumbai) under 12A/80G. We want to make it NGO. We are not clear about the difference between NGO and Trust. Can we call our Trust as NGO too/ or do we have to do separate registration for NGO. What will be the procedure for same. Do we need C.A/Lawyer to do this registration. Trust is also a type of NGO. You can very well call your Trust an NGO. I am going to start a trust for educational facilities. can i use my residence address same for office address. Hello Sir, I have a educational trust running past 7 years,I have not registered in 12A and 80G benefits with Income tax. Can I do it now.? thanks. There are no such charges involved. They may reject the Trust’s name proposed by you. But they can not charge a fee for the approval of Trust’s name. Sir, we are establishing a private school. Shall we establish the same through Trust or through NGO? Will you please help us with the brief pros and cons of both the route? Shakil, all the pros and cons have been explained in my articles. Please read them carefully. sir,i want to form a international level trust.can u guide me for the same.can i use the word international or asia in the name of trust. You can use the word “International” in your NGOs name. But there is nothing like an international level trust. If you want to work in various countries, you’ll have to register branches of your trust in all those countries separately. Sir, I want to start a public social welfare charitable trust. i want some clarification about the following. 1. can i do social welfare, charitable,educational (edu-institutions), health medical activities, all under one trust? I am a OCI member and having Aadhar card, i am helping my Indian friends to set a Non Profit Organization Society to help people in my state/ Country. I was told by my CA that our request was denied because we need a permission from the Central Govt for registration. Iam not in the board and I don’t want to be in that society. My question to you that certain names like ” India” and National level organizations should require permission from the state/ central. NGOs are not supposed to use the word “National” in their names. Trusts are by default free to work at national level. There is no need to boast of a “national level” organization. Use of the word “National” gives a notion as if the NGO is related to with the government. Clearly, the Govt. of India does not want this to happen. And I support government’s stance on this. I want to register a non profit organization with the name”National council for Social justice’ in Andhra Pradesh. when it was submitted by a CA for registration, it was rejected by the ROC, What are the reasons. Please answer to this question. Words like “National”, “India” are not usually allowed in NGO names. However, it depends on the context. The idea is that the NGO name must not give an impression that it is related with the government. Hey! Grateful to see such a clear and short article on the registratrion process. I have been banging my head researching and coming up against only walls for all my queries as yet. The thing is I am helping a friend who wishes to set up a trust in India to fund grassroot agencies. This friend is a foreign national at present and will probably get an OCI card next year. I have been advised by some that they cannot be trustees since they aren’t indian citizens while others tell me it is possible. Really confused how to go forward! They obviously do not have an Adhaar card which I am told has again become compulsory for the registration. Also what exactly would be the role of the settler- Since there is no ‘winding up’ of trust permitted the settler becomes a redundant post once the trust is entrusted to trustees right? please help if you have some clarity. Thanks for your comment. I do not have any clear information on whether OCIs can become trustees. So, I will not say anything on that. However, if you get to know something concrete on this issue, please be kind enough to post it here so that others can also benefit from it. As for Settler, well, settler is just a trustee who initiates the trust. She is usually the one who comes up with the idea of trust and who acts as the first trustee. Once the trust is established, settler can leave the organization. But that should be done under extreme circumstances because settler is the corner-stone of the ideology and objectives of the trust. Donors and volunteers identify trust with the settler. But legally there is no problem if settler leaves the trust. You were right about the hefty fees by the CAs! Anyhow, since we are being advised now by a CA, the OCI card holder or any foreign citizen can register as a trustee. Settler has to compulsorily have adhaar card which means has to be an indian citizen. however trustees can be foreign nationals (not even OCI required) but there is a request of character clearance sent from the MHA in India to the foreigner’s embassy when the registration request is received and that clearance process can take up to 6 months. For the Section 8 Company there is no such clearance needed making it much quicker but very very technical and janta unfriendly. Although compulsorily if two directors of the company are foreign nationals they need one indian RESIDENT director on board as well while registering. The overall compliance costs do go up for the Section 8 Company compared to a Trust or Society but also brings in much more transparency. Thanks for the useful information, Greeshma! I also recently heard that Aadhaar Card was made compulsory. Your information that foreign nationals and NRIs can also be trustees is particularly important because it is an often asked question in this forum. Thank you. Can you please tell me how much duration does it take in forming a Trust ? It takes about 10 days to get a trust registered at the sub-registrar’s office. Hi, i am not sure if you are still actively replying to posts on this website. However, it wont hurt to ask a question. I was wondering if setting up a foundation is the same as setting up a trust in india? How to register a private trust ? Can I form a private trust with me and my father as settlers and my sister and my mother as beneficiaries ? How to the beneficiaries use the trust money in such a case ? Thanks for helping out people who are willing to open an NGO in India, I really appreciate your great work. NRIs and OCIs are contributing a lot in India’s development and many more are willing to open NGOs in India. But I found that guidelines for OCI registering an NGO in India are not clear.Some lawyers say OCIs can register an NGO, while others say that OCIs are not Indian Citizens so they cant register an NGO in India. Can you please do some research in this area and tell us some facts, that will be really helpful not only for me but also for lot of other OCIs who want to contribute towards the mission of making India a developed nation. Can I register my NGO online. Is there any online registration/application link for the same in Madhya Pradesh? No, as far as I know, an NGO can not be registered online. The registration process has been mentioned in the article. Dear Lalit ji, we want to open a computer institute, School and want to do some social activities, for this purpose we want to register a trust in Sultanpur Disstt. of UP. kindly suggest it can be done under a trust , if yes kindly suggest name, phone no of Lawyer if you know any body. and where is office of registrar for registration of above said area. I am living in canada and will like to help the poor people of india with education,food etc.will I be able to open a bank account and purchase agriculture land that my trust will need?I am a canadian. You can certainly open a bank account in the name of your trust. But I am not sure if you’ll get any concessions while purchasing agricultural land in the name of the trust. Please consult a lawyer. I am aware that if we want tax exemption, we need to apply 12A/80G. I want to know if this tax exemption is applicable for the trust or all the member of trustees who work in different organisations. Exemption applies ONLY to the trust’s account. Trustees and all other individuals associated with trust will have to pay their taxes as applicable. We are a group of people who studied in a school. We would like to form a public trust to do lot of activities which can be benefited for the society. Please advice. this is Sanjay here, I want to know that a state govt. employee may be the member of a trust and can hold the position of treasure. pl help me out with your kind reply. Hello Sanjay, many people ask this question, “Can a government employee become a trustee?”. The answer is yes. An employee of Government of India or State Governments can become a trustee in a trust. But he can not draw ANY benefit from this trusteeship (trustees are anyway not supposed to draw any benefit from the trust). Also, the trust should not have any political or religious affiliations. It is not at all required to add words like “Foundation” or “Society”. Such words (or anything else) may need to be added if a society with the desired name already exists. 1 How many persons (minimum) required as a member in trust and how many minimum family members join as a member of trust like wife, sons etc..
Dear Dhruv, answers to all your questions are there in the article and given links. Can I register an NGO with the word foundation at the end? Can the trust be situation at home initially? Does it have to be a separate location? Yes, as long as owner of the house gives you NOC, you can have registered office of a trust in a residential building. If the settlor or any of the founding trustees are the owner -then even NOC is not required. I want open charitable trust in gujarat with name of XYZ Charitable Trust but XYZ Educational and Charitable Trust & XYZ Foundation is already working in Mumbai. Can i open in Gujarat? You want “XYZ Charitable Trust” as name… then where is the conflict? The other two organizations are named XYZ Educational and Charitable Trust & XYZ Foundation. There is no conflict in name. However, you may look like (or be accused of) stealing brand reputation of these organizations as your name is quite similar to them. Hi Lalit… thank you for the very informative post. I am an OCI and would like to setup a Trust in India with my friends who reside in India. The Trust will buy an office space in the immediate future. So, can I be a trustee on this board or would my being an OCI make me ineligible? I am planning to start a foundation / charitable trust to help the govt school. i was told that as a president i need to submit my house tax , but i do not have a house. What else i can provide other than house tax for paper work? I want to know does an NGO(Trust) require a shop and establishment license as well? for adding more trustee is that all other old trustee have to go for amendment..
Mr. Lalit, Please guide me whether changing the registered office of a trust from one city to another city and within city is possible? Hi Anjali, your question is good but unfortunately I don’t know the answer for certain. If you get an answer from somewhere, I would request you to share it here for the benefit of everyone. Thanks! I have some land at village place and wish to donate to a spiritual trust. But, at present, the trust is not willing to accept it since it is in remote place. So, I would like to form a trust with my fellow friends. Can this trust be donated (merged) into the other trust later ? When a trust is to be dissolved, its assets are transferred to other trusts having similar objectives. You have written these articles in 2011, are the procedures, rules & regulations still the same for registering society or trust and applying for 12A, 80G & FCRA? What are the procedures for applying to get FCRA. Reading the articles, registration & compliance for Trust looks great & easy, yet what are the benefits still to register for society? Your response & advice much appreciated. Thanks! Hi Eddi, as far as I know, things haven’t changed much. As for benefits, well, Societies are more democratic than trusts. Societies are created when people don’t seem to have enough trust among them. In case of a Trust -all stakeholders keep their trust in the Trustees. Societies could be more accountable if a problem arises. 1.What is the powers of Settler, trustees? 2.Gov. giving any guidelines for power distribution or We should meet any criteria? 3.Settler can add/remove any trustee from trust? Hi Prabu, in case of trusts, all the rules / power distribution is defined in the trust deed by the initial trustees. Trustees can be added or removed later on. 1. If a Trustee of a Trust, doing full time job for the Trust, can he/she get salary/compensation for his/her livelihood? 2. Can a Trust earn money by producing goods and services and selling it ? The whole income will be used for the welfare of the society or meet Trust objects. 3. Can a Trust Employ people to meet Trust Objectives and give them salary? 4. If answer of any one of the above is “”YES”, shall all above points must be mentioned in the Trust DEED? I am planning to set up an Alumni Organisation whose members will be pass-out students from different batches of our school, currently working in different fields. For the same, we want to contribute some money each (monthly / annually / as registration fees, etc) and use the fund in activities like meetings, gatherings, social works, scholarships to some good students of our school, etc. But I am confused how to safeguard this fund? do we need to create a trust / fund for this? if yes, could you please let me know if there is any special provision for Alumni funds? Will we get any tax benefits ? For a charitable Trust, can a foreigner be a trustee, on the Board of the Trust? Or must all the Trustees be resident Indians? Are you sure that the word India cannot be used in the Trust name? Hi Ming, both of your questions are good.But unfortunately I can not answer either of these with 100% surety. As far as I know, the words India and National can not be used as part of the Trust’s name. I am not certain however. You should consult a competent lawyer or go to the registrar for clarifications. Lot of thanks for writing the article and continually replying the queries. I have covered all of the article, queries and your honest reply to many. Now Policing of India is done by Police Act-1861, which was prepared during the colonial period. There are many commission and commissioners view on change of the old police act. There is also apex court judgment on implementation of “New Police Bill-2006”. But the result is – no state want to adopt, because of change of political power on the Police. I feel, public needs to be made aware for the issue, that “New Police Bill-2006” is essential for the sustainability of Indians. So, I am thinking of making a blood donation camp for the awareness of the above issue. So, the purpose can be fulfilled by making a society or by making a trust. Need your kind guidance. Regards. Hello Shriya, for organizing just one blood donation camp -I don’t think you need to get into the hassle of registering an ngo. However, if you want to continue your work on long term basis, you need to choose between a trust or a society. You should see my article on the differences between trust and society. I have given all the facts -just make your choice as suits you. No one else will be able to advice you on this. Just know what a trust is and what a society is… then make your choice. – Can I receive donations without having a registered NGO?, however I would be using the donations only for service. If yes, why people would like to open a trust to do the service? Hello Sirish, you’ve have asked a reasonable question. Well, you can receive donations without registering any ngo. But in such a case, Income Tax Department will see all those “donations” as your personal income. You’ll have to pay tax on that. When you register an ngo -you can apply for tax exemption from IT department. Once you get this exemption -you will not need to pay tax on donations received. Moreover, your donor will also get tax rebate of the amount s/he donates to you. Also, if you don’t register, you wont be able to apply for grants that are provided only to the registered ngo. A trust/society is an organization whose audit is done. Such an audit keep your donors happy that you are not misusing their money. Good Work Done Mr. Lalit. Keep Going. Best of luck. please tell me the procedure for conversion of Public Charitable Trust into Pvt. Trust and the related documentation. So far as I know, it is not possible to convert a public charitable trust into a private trust. Consult your lawyer for more accurate information. I have also been thinking to start a ngo from quite a long time.I live in madhya pradesh and want to do some work towards women and child welfare. After reading your post,gained so much knowledge about registering a trust. Though i am still not clear about how and which way to start off, i mean register a trust or society or a company? Since i have told you my objectives can you pls guide me the most viable way to kick start my project. Also can you tell me roughly about the money/financial expenses(considering all the price changing elements) involved in registering these trust, society & company. Suhail, I have listed the difference between trust and society. These differences should give you enough background to make your own decision. Registering a trust or society costs not more than a couple of thousand bucks. On 06/02/2014, I went to register my trust namely HINDUSTAN EDUCATIONAL INDIA TRUST in Sub Registrar Office at Perundurai, Erode District, Tamilnadu but the registrar refused to register my deed then he compelled me to eliminate the word INDIA from the name of the title and he said that it is offence and illegal. At the same time he was not ready to explain for the same. After long argument I replaced the word INDIA by INFO, then only he registered the same. Now I want to know weather it is offence or illegal, if not so, can I register rectification deed to change the name as HINDUSTAN EDUCATIONAL INDIA TRUST instead of HINDUSTAN EDUCATIONAL INFO TRUST. Please reply at an earliest. Recently I went to register a trust in the name of HINDUSTAN EDUCATIONAL INDIA TRUST in Perundurai Sub Registrar office, but the Registrar compelled me to eliminate the word INDIA. He is saying that adding the word INDIA in the name of trust is offence and illegal, at the same time he is not giving right explanation. Then I replace the word INDIA by INFO. Then only he registered. Now I want to know weather it is offence or illegal, if it not so can put an rectification deed to change my name of the trust. I think the Registrar was right. As per my information also, it is not allowed to use words like INDIA or NATIONAL in trust’s name. However, I can not cite any law/rule in this regard. The information you have provided through your article and the answers are just so informative. Its so useful for someone like me who wants to set up a trust or society and have almost no knowledge of this field. I belong to a remote village. We raise fund for meeting the cost of operations, maintenance and construction of our madarssa, masjid and kabristan. My ambition is to make the things more organised by raising more funds and investing them on beter education. Can you please suggest what would be the better option to opt for, Society or trust ? Please give your input as much as possible in this regard to help me contribute to me community, my society, my country and the humanity at large. we have registered a trust in delhi for church(religious activity) and Charity work so can we get 12A and 80G. I have registered a trust.Now I have two question in my mind. 1.I want to open a school under my trust.Can I do that.If Yes than How. 2.if so, then if I not get sufficient funds and donation than can I take some amount of fees from student. Is it legal. Sir you have done a great job. I was getting confused from a long time between these two. But after reading your article , there is some clarity. Now, I have some queries and I will be very greatful if you answer those. 1. I have taken a study center from university. for this i was planning to open society but after reading your article i think i have to open a private trust. is this correct? 2. where the trust get registered? I am a NRI. I would like to give back to India starting with my village. I am interested in opening charitable trust but I do not have a property to give. I will be spending money to improve education or water treatment etc. I do not know how to go about it, means, trust, society or NGO or company? Also I have a NRO account. Can I fund with this account or do I need RBI permission? mam i really appreciate u wann to do a lot of thing for poor people mam i also wann to open a trust for orphan girls child for there health and education mam if u dnt mind can we open together and run . respected sir pls help that for registering a trust under Indian trust act 1882,an resident of delhi is compulsary,.?? and can we change Author,.?? if yes how,.?? I must congratulate you on igniting interest among so many people to give back to society! 1. What’s the difference between Trust & Foundation? 2. Which of above considered as NGO? 3. If my NGO is registered in Mumbai then can I accept donations from other states/cities and countries? 4. If yes, then any legal implications? 5. As I said am in media profession, alongside my professional services, I tend to do social work in area of awareness for public cause. And such research will require donations. So, will it be an issue if register name of my Trust or Foundation under my company name? Because I have seen some companies register their Foundation with their company name. Like Tata Research Foundation. 6. Do Foundation also get 12A, 80G and FCRA? I could see above that you have been flooded with many questions but I am hoping that you will extend your guidance to me as well. 1) Foundation is just a word which some people use as part of their NGO’s name. It is not an entity in itself. For example “XYZ Foundation” is just a name and it can be registered as a non profit organization under one of the three type: Trust, Society, Section 25 Company. 2) You can register your NGO anywhere in India and can accept donations from anywhere in India. But in order to accept donations from foreign countries you would need FCRA certificate. If you accept foreign donations without having FCRA certifcate -you’ll be in a soup. But donations from within India does not requires any special certificate. 4) As I clarified, “Foundation” is NOTHING -it’s just a word. When you register an NGO and you want your donations to be exempted from income tax -then you need to apply and acquire 80G and 12A… FCRA is also required if you want to receive donations from foreign lands. I hope it answers your questions. Please consult a good lawyer if you have more questions in this regard. To open a charity with my husband. We come from business families. My question is what should I open if I wanted to physically give back myself to the women and children I work with and also opening a trust can u get charity from outside or does it have to come from u only. Please email and advice. I am from Bombay. Also I want to link it to international funds. I have opened a trust named YUVA. How many days will it take to open a bank account of the trust in a perticular bank. Thank you sir for your usefull article and advice…sir i have a query..am planning to start a group which works for the development and spread of homoeopathy in kerala,including medical camps,book publishing etc…for this i need advertisement and helping hands from public…i want to make this legal..so please let me know under which i register my group…. The information you posted is very helpful for new people like me. But I am still little confused, can you tell me the suggestions for my plan? Plan – I want to serve 4 categories people at one place, I am planning to buy a land and do construction so the homeless people can stay for free. The categories I am concentrating are 1. Old age people, 2. Orphans 3. Unsecured women 4. Handicap people. Would like to provide all kind of facilities as needed. For above mentioned project, do I need to register under Public Charitable Trust OR Society? Once I register, can I get tax benefits (12A & 80G) and FCAR? Other than my questions, please suggestion me anything that you think of useful to my project. I am glad that my article has been of use for your noble cause. In my opinion, you should register a Trust. You’ll be eligible to get 12A, 80G and FCRA. You’ll need to apply for these certificates at desk of the Exemption officer of Income Tax Department under whose jurisdiction your registered address falls. Lalit, I found an old trust, which they are planning to sell to someone. it’s 13 yrs old trust having good record and FCAR, 80G…etc. Can I buy it?, if so, what are the rules I need to consider and the process? i really appreciate u wann to do a lot of thing for poor people sir/mam i also wann to open a trust for orphan girls child for there health and education sir/mam if u dnt mind can we open together and run . Very helpful article. i would further like to know if there can be an advisory board to the trust who are not trustees and what happens in the event there are surplus funds in the trust at the time of dissolution? Yes, you can constitute an Advisory Board. You need to write in your Trust Deed as to what you will do with remaining funds if and when Trust gets dissolved. Usually such funds are donated to other organizations with focus on similar charitable activities. what is difference b/w a trust and NGO…? even if trust is not an NGO,is there any procedure to convert a trust into an NGO….? Well, a trust could either be a public charitable trust (which makes it an NGO) and a private trust. I guess a private trust is not considered an NGO. Please speak with your lawyer about how to convert. As I am not a law expert -I will not be able to advise you on this matter. Thanks a lot for the information sir.i have a doubt regarding this….i want to be the sole owner for a charitable trust and take care all the activities as per my wish and will…is it possible ? or should i have to register as some company or what ? please give clarification. I am really loving the theme/design of your blog. Do you ever run into any web browser compatibility issues? A handful of my blog readers have complained about my blog not working correctly in Explorer but looks great in Opera. Do you have any ideas to help fix this issue? Does settler have special powers compared to other trustees ? Can there be more than one settler ? Hi.. Thanks for such an elaborative and wonderful article. I just have one query, can a trust be opened in name of an entrepreneur. Say, my friend is running a magazine, which is registered under shops act. Can a charitable trust be opened in the name of the magazine. Well, I don’t think you can open a trust in the name of a business. Trusts are for charitable purpose and it is advisable to keep it away from all business activities. For more information, you should consult your lawyer or CA. I think, trust can be opened closely in the name of your business name. eg Reliance Foundation belongs to Reliance Industries. For an 80G process do we need to complete the 3 years auditing. No. You can apply for 80G right after registering the trust. I want to open one CBSE school with help of investors . Obviously I need to return profit to them. So can I go with trust,it should be private or public trust or any other way I can proceed.Please be in detail why and how can I proceed. hi Lalit. Thanks for the information. here is my question for you: how do you change the address of Trust that is already registered? The Trust office moved to a different address. I cannot find information on how to change the address. Thanks. Thank you so much for your wonderful article. It was very very helpful. 1)I want to form a charitable trust under NGO. How long it takes to form a trust and get 80G? 2)How long it takes to get donations in the trust? 3)Please advise how long it takes to get the government grant after submitting the project report. ur article is very helpful. keep it up. god blees you. What a great sourse of knowledge.I m benefited a lot by this and now I can understand the requirements .. thanks a lot sir. Mr Lalit Kumar,its my immense pleasure to congratulate you for such a simple description how to register a trust…thanks alot.. I am planning to register a Charitable Trust in memory of my grand parents. I would suggest you take help of a lawyer. Sample deeds shall not be good enough. Thank you. I am planning to start a cancer charity in my mom’s name who I lost to cancer. This article is very helpful and shows me the way. As far as donations from government are concerned -there is no difference between a trust and a society. Getting donations will depend on the quality of work you’ll do. Better work better shall be the chances of getting donations. Excellent and well researched article. Thank You Sir for the article it is very much useful to me. 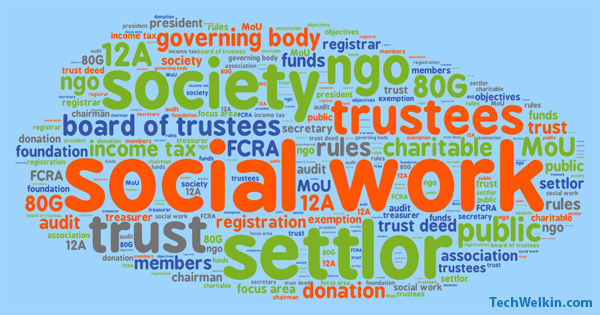 If i register a new trust then can I then transform my society(NGO) to the new Trust? Is it possible to change an NGO to a Trust? You can not change a society into a trust (or vice versa)… New entity will have to be created and registered afresh. We are going to start a trust for charity purpose. I have three questions. 1. Is it essential that after a registration, you will need to register for 12 A, and 80 G for income tax exemptions? 2. How about filing the returns? Do we need to file returns annually even if we don’t have any fund/ or very less fund for that year? Can filing be done more easily via online without any other procedures? Do we need to apply for PAN card as soon as trust is registered? Your help is much appreciated. This article is really useful for me. 1) If you want exemption, it is essential that you apply for 12a/80g… IF you dont want exemption you dont need to apply. 3) Other legalities may arise out of your trust’s objective. Consult your lawyer. Thanks Lalit. That answers all of my questions. One last thing, Is it that only a CA can file returns? Cant a normal person like me file it myself if I know the procedures? You can file returns on your own. Filing through a CA is not mandatory. If I can ask one more question, what if I need to replace trustees or add new trustees to the board once registered? Do we need to again change the deed and get it registered from sub registrar? You can add/change trustees by passing a resolution. Your lawyer will give you more info on this. And at any point ,if the managing trustee or trustees dont feel they cannot take it forward any longer, Can they unregister or dismiss the trust ? What will be the legal procedures for that? can a NRI become a trustee in private trust or member in society? I am not sure about it… but I guess its possible… please consult your lawyer about it. its good thing it help most the people, i want an information when i can apply for 80G act, and thank you for a service. You can apply anytime after registering the trust/society. Thanks for this information Lalit. I have a question. You say that all the trustees dont need to be present for the registration. If the 3 trustees are in 3 different places, can we have one person print the trust deed, sign it with notary, and then circulate that to the 2nd person who signs with another local notary and then sends to the third person for his/er signatures? Would this work? This is the procedure as per my experience. You may want to contact a local notary and confirm the procedure. if a trust can be registered in either of the place where its offices are situated??? The timing for this information is perfect . Thanks a ton Lalith. Thanks for such a good peice of advise which is really useful to many. I have 2 query on Trust — you mentioned at the top that private trust dont have Tax exemption. But below in – Other Important points – you mentioned the tax exemption process. I am a bit confused as I want to have a private trust. I would like to have a standard trust deed. From where I can get that. Thanks for the article. alokedaga@yahoo.co.in, 9433012322, Kolkata. The information given in the article applies only to public charitable trusts. Please see a lawyer to get more information on private trusts. I am going to open a Public Charitable Trust, but i was in vain what are the basics of it and what are the step by step procedure for registration of the trust and tax exemption registration but after going out from the stuff you have written here i am bit relaxed that if we do all these thing step by step its not such a big deal which i can’t handle thank you very much…..just one more thing can you please guide me about how much the lawyer charge for registration for tax exemption and can i make my trust deed based on a sample trust deed i have by my own. I am glad that this article has been of help to you. Although I know roughly how much lawyers charge for registration of trust under 80G and 10A but I would refrain from commenting on it because the amount may greatly vary from place to place and the person you will contact. However, I would suggest that you contact a CA for such registrations instead of a lawyer. CAs know better of this stuff and can provide necessary financial documents if required by the Income Tax Department. Yes, you can write your own trust deed but it is advisable to show it to a legal expert to ensure that you have covered all important clauses. All the best for your charitable work. Thank You Mr. Lalit for your kind concern and reply, dear i want to bother you again about one thing or rather two things that can i get some sort of registration number when i register my self (trust deed) to the sub registrar office and second is that can i run my trust without registering it to the income tax department , i mean if i don’t go for the tax exemption clause can i do my work without any problems? Yes, you get a registration number from the registrar. Yes, you can run your trust without registering it with the Income Tax Department -but in that case all the income (via donations or otherwise) of the trust will become taxable and you’ll have to pay tax every year like any other profit making establishment does. Thank You very much for giving me guidance….May God fulfill my wish to run a charity trust successfully and you know indirectly you also became a part of it. Thank You again for your great concern i hope you will also guide me in the future. If you don’t mind can we share our email ids so we can be in contact through that in near future? We would like to create one society of 40 person. purpose will be : create a fund to help each other. so let us know what is best society or trust ? The article is really helpful.. I have a question though. We need the settlor and two witnesses at the time of registration. When can we add a trustee? You can add trustees anytime after registration by passing a resolution to this effect. I am sorry, but I dont have any credible information about this issue. You cant have two Trusts with the same name. You would need to search for a name. Unfortunately, database for registered name is available only for Societies and not for Trusts. Please let me know if you know about any such database. Where can we find the list of the registered society in India (especially in Kerala)? HI , I have got a trust registered lately. Only recently i came to know that another ngo exists with same name. Does it matter? Doesn’t matter Mr Tushar. Society and Trust are being registered under different entity. They can have the same name. Dear Mr. Lalit Kumar, very informative & thank you so much. I have few question. 1. Our trust deed is registered in Sub Registrar office. In addition should we get it registered in registrar of companies / firms? 2. In addition to trust deed, should we have a separate bylaws? 3. Do we have to file IT returns even though trust is under loss? I have registered a trust in the year of 2005. at Mangalore Karnataka.in Sub register offce Mullki. With the help of Lawyer. We have done several social activates. Now we want to move our activities to Mumbai. Since our registration at Karnataka can we do our activities at Mumbai. can we register a society of seven with 3 family brothers. As far as I know, this is not possible. Governing body of a society can not have people who have blood relationship. i want to confirm this…can a public charitable trust with two founder members be blood relatives? like mother-daughter? and if no then how many more governing body members are required to be added at the time of registration. 2 Can an NRI be a trustee? You can register your trust anywhere as long as the owner of the registered office does not have any objection.